8 Dragons slots is a 5 reels and 20 paylines video slot game coming right from Pragmatic Play. 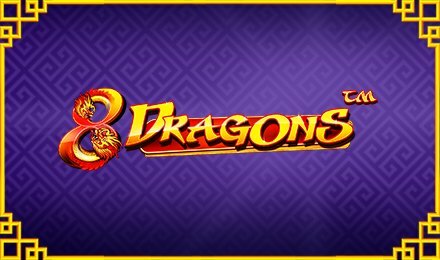 This slot game comes beautifully designed around an oriental theme where dragons and other lucky Chinese symbols roam the reels. You could benefit from a number of wilds, stacked symbols, free spins and scatters. These will surely get you winning! As it is embedded with lucky symbols, there are various types you will find. Find a sea of symbols like Lions, Fish, Tigers, Dragons, Gold Coins, Gold Ingots, A, K, Q, J, 10 and 9 landing on your reels. To trigger wins, all you need to do is make winning combos from left to right of the slot reel. Wins must be made on active paylines or the game does not pay out. Take advantage of the Autoplay option, which allows you to select a number of autospins that range from 10, 20, 30, 50, 70, 100, 500 and 1,000. Amount of Lines Selection: All 20 paylines are fixed and cannot be altered. Coin Values: Coin values range from £0.01, £0.03, £0.05, £0.10, £0.20 to £0.50. The Dragon is the wild of the game and takes up two positions on the reels whenever it lands. This is called the Stacked Symbol feature. When it forms part of a winning combination, you are awarded 2x your bet. If you’re ready for lucky wins, you can launch this game now at Vegas Spins Casino! Play on your mobile, desktop or tablet to enjoy thrilling features!